« Women, It’s Time to Stand Up and Count! If you have been feeling blue with the dredges of winter too slowly receding, and spring rain just making everything muddy, then it’s time to breathe some sunshine into your life with a fresh perspective. Just like the weather, your business goes through muddy seasons too. How you perceive these periods is completely within your power. The most successful people learn how to be grateful for the challenges, as much as they are for the victories. There is tremendous value is both, if you are open to seeing and leveraging it. 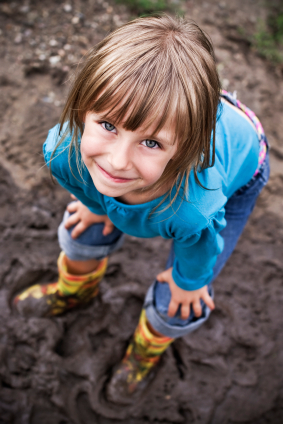 If your business has been feeling a bit “muddy” lately, perhaps you need to spend some time making mud pies, rather than worrying about the dirt. By shifting your perception of your reality, and looking for the benefits woven into your current situation, you will be open to discovering the gifts of perseverance, and gratitude for every lesson in life, no matter how painful. This entry was written by Dr. Shannon Reece, posted on May 4, 2011 at 9:34 am, filed under Tip of the Week and tagged businesswoman, entrepreneur, fresh perspective, overcoming obstacles, positive attitude, startups, strategies for women. Bookmark the permalink. Follow any comments here with the RSS feed for this post. Post a comment or leave a trackback: Trackback URL. Great perspective. One of the most difficult things of running a business is having to look for ways to stay optimistic, specially during the first months. I will put your post into practice this evening while I give meditation a try. Thanks for your comment, Daisy! You’ll have to let me know how your meditation goes. 🙂 Perspective, especially in the face of obstacles, makes all the difference between success and mediocrity.